Chester, PA—June 16th, 2018— The hopes of returning to a second consecutive Lamar Hunt U.S. Open Cup final were dashed Saturday night for the New York Red Bulls who fell to the Philadelphia Union at Talon Energy Stadium 2-1. This was the fourth consecutive year that the Red Bulls and Union had faced each other in the U.S. Open Cup and the third time out of four that the Union of come out victorious on the night. Andre Blake got the call for the Union in net and was opposed by Luis Robles, who replaced Ryan Meara who was supposed to get the start but did not travel due to injury during the week. The match was the first in a while for Kaku who had missed the previous few games after being called on international duty with Paraguay. The MLS assist leader made his presence known in the fourth minute, feeding Carlos Rivas on the counter attack, but the Colombian fired the ball over the net and into the River End. The Union would get a great chance of their own three minutes later when forward Cory Burke got behind Aurelien Collin and was shouldered down by Hassan Ndam but was ruled not to be fouled ending the chance. After a back and forth first 10 minutes the New York Red Bulls maintained a majority of the possession but lacked the last key pass to get any significant opportunities on goal. The home side would get into the flow of the game and would take over after the 25-minute mark. In the 28th minute, Philly winger Ilsinho received the ball on a quick counter-attack but fired his shot just over the bar and into the stands. On the other end just two minutes later midfielder Marc Rzatkowski received a deflected pass at the top of the box. However, his looping shot went just wide of the right-hand post. What came in the next 5 minutes could only be described as a shooting gallery on the New York Red Bulls net. In the 31st minute, USMNT midfielder Fafa Picault got on the ball on the left side of the box, sending a cross to the penalty spot to a wide-open Cory Burke. But the Jamaican international’s header somehow went just wide of the far post. In the 34th minute the Union would get two golden opportunities in the attacking third. First, Picault received the ball on the left side of the box, but his low curling shot was palmed away by Robles. Then in what seemed like an instant replay, just seconds later, the ball again fell to Picault in almost the exact same position. Again, Luis Robles was equal to the task of his low curling effort but this time the rebound feel to Burke who had the entire net to shoot at but somehow put the shot high. The Red Bulls would get one good look at the end of the half when Kaku sent a long curling ball from the midfield to the feet of Rivas, but his shot was sent just over the bar by Andre Blake and with that the teams went to the locker rooms at 0-0. As has been the form in recent games, the Red Bulls started brightly in the second half. In the 49th minute a cross from Rivas was touched on by Derrick Etienne Jr. to defender Kemar Lawrence who fired a shot that was saved by the legs of Andre Blake. The rebound then fell to Marc Rzatkowski who’s shot was just tipped over by Blake who recovered nicely. Two minutes later Etienne got on a high deep ball and went on a breakaway, but before he could unleash a shot, young Union defender Auston Trusty came from behind and poked the ball away, relieving the pressure. The hosts would respond and open the scoring in the 53rd minute when Haris Medunjanin received the ball at the top of the box, and after shaking Tyler Adams fired a shot that deflected off a player in front and past Luis Robles. Jesse Marsch, now having to chase the game, brought on regular starters Bradley Wright-Phillips and Daniel Royer. But before either man had an opportunity to make a difference, Philadelphia doubled the lead as Cory Burke beat the offside trap on a pass by Alejandro Bedoya and calmly finished the ball past Robles to make it 2-0. The Red Bulls would get back into the game in the 77th minute as the MLS assist leader Kaku, slipped a pass through to Wright-Phillips. The English striker who has scored 10 times during the regular season remained calm in front of goal, received the pass and put the ball past Blake to halve the deficit at 2-1. Just four minutes later the connection almost paid off again to double the lead as Wright-Phillips laid the ball off to Kaku who fired a low shot to the right-hand post but Andre Blake was equal to the task again getting his fingertips to the ball to send it wide. That would be that last good attempt for the visitors who despite a few half chances, could not find the golden touch and the game would end 2-1 to the Union. The match in Chester ended a grueling stretch for the Red Bulls, their 5th game in 15 days in which they went 2-1-2. The week ahead will be the first week of normal rest and preparation in the month of June for Jesse Marsch and his club who can now focus their attention solely on the MLS regular season and the dream of winning the franchises first ever MLS Cup. 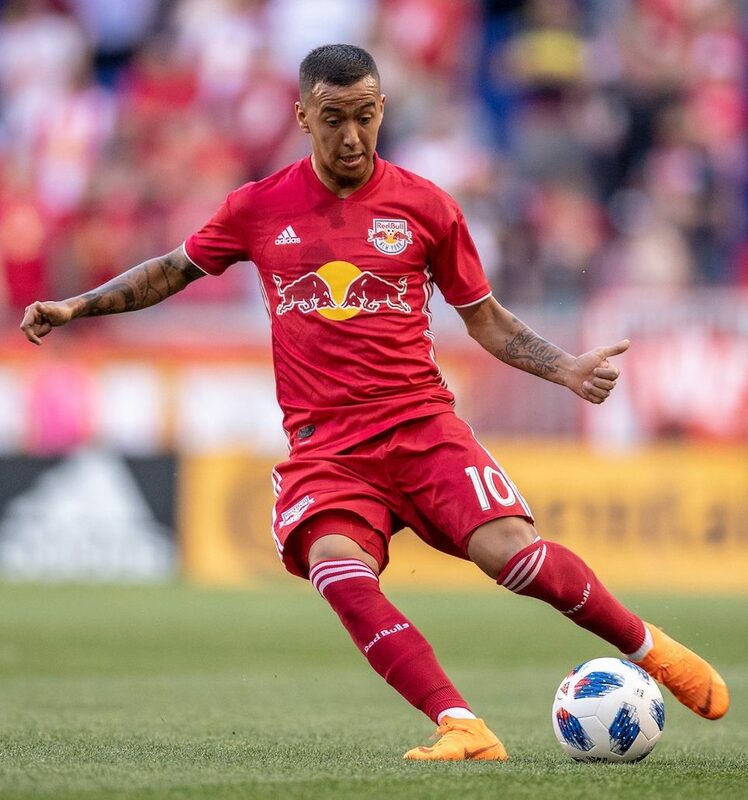 The MLS season will continue next Saturday in Harrison, as the Red Bulls host one of the top teams in the Western Conference FC Dallas in a 6 pm kickoff.